As director of athletics and recreation at Simon Fraser University from 1965 to 1995, Lorne Davies built an athletic program that was considered one of the best in the country. He created an atmosphere of success which produced many of Canada’s Olympic athletes and many players for the Canadian Football League. As athletic director, he was well known to the athletes and always available to provide counsel on sport, career and life. 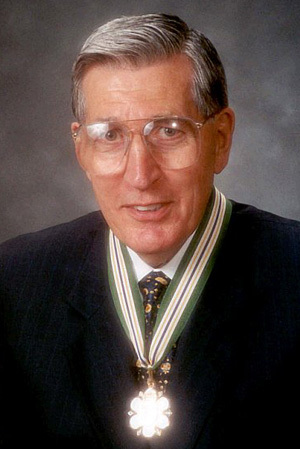 Lorne Davies was a pioneer in Canada in recruitment, marketing and facilities. He established the first endowment fund to support a university athletic program. He is a fundraiser, a volunteer, a leader, a motivator and a teacher who has left behind a legacy of successful university graduates who have gone on to success in their professions. His coaching career also took him to Western Washington University, University of Oregon, University of British Columbia and the B.C. Lions. He has volunteered his time and expertise to a number of provincial and national organizations. He is currently the executive director of the Terry Fox Humanitarian Award Program. In the past, he served as the chairman of the Provincial Drugs in Sport Task Force and a member of the Provincial Anti-Doping Advisory Committee. Lorne Davies has led an exemplary life of service to young athletes. He won the Premier’s Award for Outstanding Contribution to Sport in B.C. in 1994 and in 1995 was inducted in Western Washington University’s Sports Hall of Fame.